Intensified border controls and development cooperation have become the pillars of European immigration policy over the last decades. Yet, the consequences of these policies are often wrongly assessed - in part because discussions about migration and ‘how the problem can be solved’ are often disconnected from analyses of wider social changes. Recent scientific insights can provide a useful orientation in those debates and explain why development cooperation can only be a long-term strategy to reduce emigration; why more border controls paradoxically lead to more irregular migration; and why migration policies can only be effective if they are coherent with structural developments and wider policy goals in origin and destination countries. One credo of today’s migration policies is that development cooperation reduces emigration. Yet, this is only partly true. 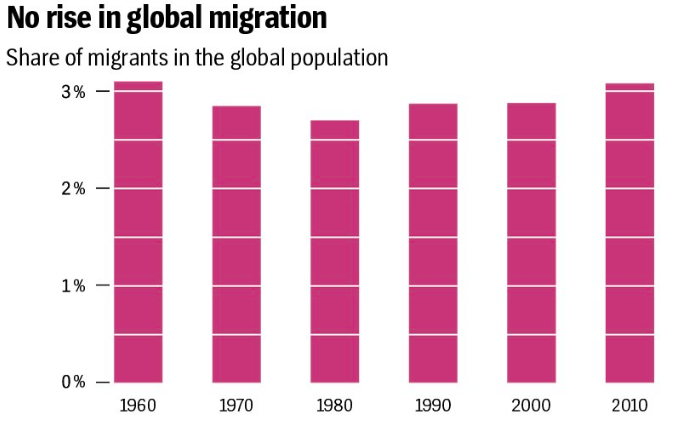 As Ronald Skeldon (Sussex University) has shown in his studies on Asia and Latin America since the 1990s, development generally boosts emigration. This is because rising incomes, higher education levels, as well as improved transportation and communication infrastructures increase both people’s aspirations to migrate as well as their capabilities to realize them. First insights from the Migration as Development (MADE) research project at the University of Amsterdam also show that globalization has in the first place accelerated emigration over the past decades, as in the case of migration from Ethiopia to the Gulf States or from Morocco to Europe. This also explains why the countries with the highest emigration rates worldwide are neither the poorest nor the richest countries, but those with intermediate development levels - such as Mexico or the Philippines. 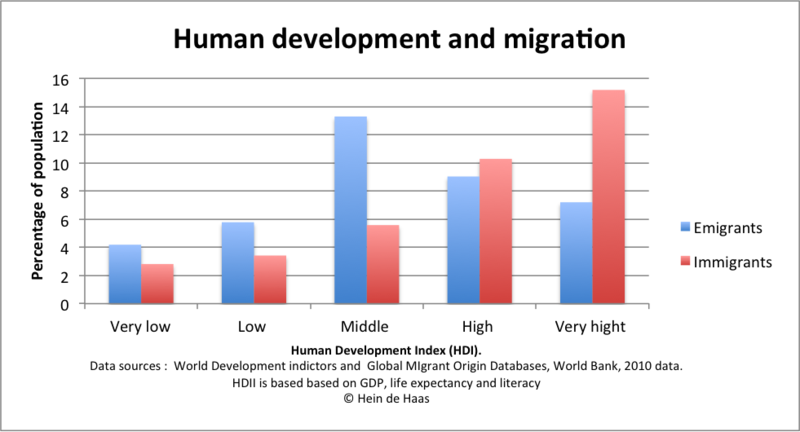 Only at a relatively high development level does further development reduce emigration. The evolution of Italian and Spanish migration patterns since the 1980s are powerful examples of this transformation from emigration to immigration country. In a 2014 study, the economist Michael Clemens has identified this tipping point at an average income per capita between USD 7000 and USD 8000 per year. But he also highlights that the exact level of this tipping point highly depends on the respective national socio-political context. Nevertheless: The fact that average per capita incomes are still well below that threshold in most Asian or African countries, apart from those rich in natural resources, suggests that development cooperation can only be a very long-term strategy to counter emigration, at best taking several decades or generations. 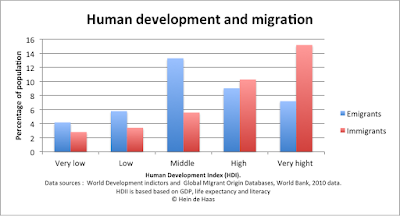 In the short run, development is more likely to boost emigration from such countries. But migration policy decision makers do usually not take into consideration these complex dynamics. The result of this widening gap between the reality of migration patterns and migration regulations is irregular migration. A widespread and in the very short term often successful answer to irregular migration is the intensification of border controls - through the construction of walls, the deployment of police and military, or simply through more red tape. The closure of the ‘Balkan Route’ starting in October 2015 at the border between Hungary and Serbia is only one example of this logic. Yet, this does not prevent migrants and especially refugees from countries like Syria, Eritrea or Iraq from trying to reach Europe - they now only choose longer, more expensive, more dangerous and also deadlier routes. One result of this situation is the growing number of deaths in the Mediterranean Sea - the International Organization for Migration counted 2905 deaths between January and June 2016, nearly twice as many as in the first six months of 2015 and four times as many as in 2014 over the same period. By mid-December 2016, this number has further risen to 4742 deaths. Paradoxically, rather than achieving its proclaimed aim of ‘combatting’ smuggling networks, increased border controls result in their professionalization. And ironically, the most common response to this result is the further intensification of border controls. This creates a morally and financially counterproductive vicious circle in which border controls, irregular migration and smuggling reinforce each other. In his newest publication, Douglas Massey (Princeton University) and his colleagues have indeed shown that the militarization of the US southern border has paradoxically increased the number of Mexican irregular migrants in the US: Three decades of data from the Mexican Migration Project provide strong evidence that tougher US border controls have pushed Mexican migrants to change their migration patterns - from commuting seasonally between the US and Mexico into permanently settling in the US. When is migration policy effective? 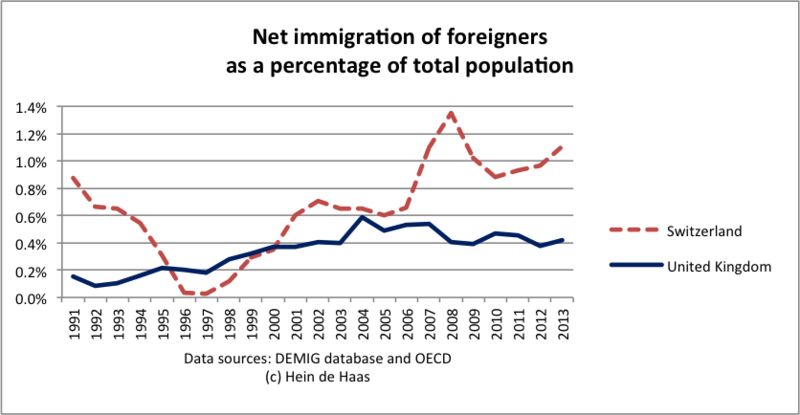 Given the intrinsic link between migration patterns and the broader social, economic and political context within which they evolve, specific migration policy measures have only very little leverage on their own - especially when they go against structural developments in origin and destination countries or contradict the goals of other policy areas such as trade, labor market or foreign policy. Thus, the growing arms exports of European countries over the past years are only difficult to reconcile with the declared aim to reduce the number of asylum seekers or to ‘tackle the root causes of migration’. Also, it is illusory to expect that specific migration policy measures can counter the migration effects of macro processes such as economic liberalization or demographic transitions - be they a result of the continuously high birth rates in sub-Sahara Africa or of the shrinking generations entering labor markets in Europe and elsewhere. This does however not mean that states have no room for manoeuvre in shaping international migration. 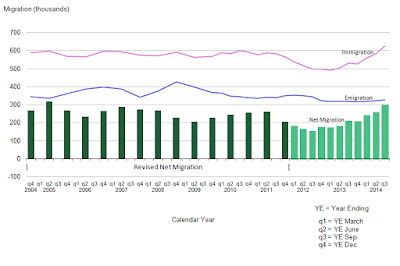 The Determinants of International Migration (DEMIG) project (University of Oxford) has shown that migration policy can be effective in achieving its goals if there is a concertation between the goals of migration policy and the goals of other policy areas and if migration is understood as a structural part of the continuous transformations of destination and origin societies. This requires an understanding of migration not as a deviation from the norm, but as intrinsic to humanity. In the heated discussion about immigration and the policy measures to ‘solve the problem’, two facts are however often forgotten: First, for a long time, Europe was the continent of emigration par excellence, be it in the context of colonization or as a result of wars, persecution, economic hardship and poverty. Only since the 1960s has Europe become a destination for migrants from all over the world, partly as a consequence of active state recruitment policies, partly as a result of its economic prosperity and attractive socio-political conditions characterized by peace and the rule of law. Second, while public and media attention is almost exclusively directed to irregular border crossings, the most recent, available data from Eurostat show that in 2014, 93 percent of all immigrants have entered the EU through regular channels. Even the important increase in irregular migration in 2015 and to a lesser extent in 2016 has not fundamentally changed this reality. 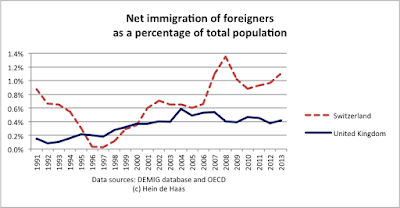 Thus, amidst all the more or less valid criticisms, it seems that European migration policies have not failed to the extent often propagated in political und public debates. About the author: Katharina Natter has a Master in Comparative Political Science from SciencesPo Paris (2012) and worked on the DEMIG project at the International Migration Institute (Oxford University) between April 2013 and June 2015. Since September 2015 she is doing her PhD in the framework of the MADE project at the University of Amsterdam, researching Moroccan and Tunisian immigration policies under supervision of Prof. Hein de Haas. While migration has become a political 'hot topic', public debates about migration have often remained remarkably fact-less. Thanks to the increase in migration research and availability of data, we know much more about the trends, causes and impacts of migration than a few decades ago. However, this knowledge does often not reach the broader public. This is highly unfortunate, since modern migration scholarship has so much to offer in order to facilitate informed debates and better, more effective policies. Part of the blame lies with politicians, who willingly ignore inconvenient evidence that would unveil their demagoguery and unnerve their migration scaremongering and scapegoating of migrants. All too often, the news media buy into - and thereby reinforce - the fact-free crisis narrative around migration fed to them by politicians. Many journalists fail in their basic professional duty of fact checking. A case in point is the false political claim that the EU-Turkey 'deal' on refugees has stopped refugee migration from Syria. However, part of the blame also lies with migration researchers, who often fail to communicate their findings in clear, jargon-free language to the broader public, while research papers often remain inaccessible behind prohibitive paywalls of scientific journals. Much knowledge about migration therefore never leaves the academic ivory tower. This is why we should highly welcome Migration Matters, a new initiative that aims to bridge the gap between evidence-based research and public debates. Migration Matters was founded in January 2016 by four women who are connected by their distinct backgrounds in journalism and academia yet common experiences of migration: Julia Karmo, Sophia Burton, Kelly Miller, and Elina Ribakova. It is entirely supported by individual donations and was recently awarded the Advocate Europe grant. Migration Matters aims to address the public’s biggest conundrums and fears surrounding migration. This is to fulfil its ambition to approach the migration debate "as an open and evidence-based conversation, where no concern is ridiculed and no question dismissed". Migration Matters does so by offering free, video-based courses that break down commonly held preconceptions about migration and offer nuanced and solution-oriented perspectives from leading thinkers in the field: researchers, practitioners, as well as migrants and refugees themselves. Earlier this year, I had the honour of hosting the Migration Matters team at my home in the Amsterdam Bos & Lommer neighbourhood for the recording of a series of 10 short video lectures on various aspects of migration. These have been compiled in a "Migration 101" course. This introductory course hopefully gives a fundamental understanding of the realities surrounding today’s debate on migration. Other courses include 'Six Impossible Ideas (after Brexit)' by researchers of the London School of Economics (LSE) and 'A Migrant's View' by origin country expert Nassim Majidi, and many more are to follow. Subscribers to courses will receive one email a day over the duration of the course with a link to a 3-5 minute video as well as hand-picked reading lists for further learning. Given the political rhetoric about migration, the Migration Matters initiative comes at the best possible time. It is more important than ever that scientific knowledge about migration reaches the public. This is essential to enable more informed debates about migration and to see through the fear-based migration politics and reporting that fan the flames of xenophobia and do not provide any solutions. Success! You are signed up to Migration 101 with Hein de Haas - a 10-part bite-sized course about why and how migration happens. Now check your email to confirm your subscription! Thanks for signing up for our newsletter. We will notify you when we launch new courses, surveys, and quizzes. To take a specific course with us, make sure to sign up through our website. Now check your email to confirm your subscription. Sovereign states have good reasons for controlling their borders. States are political communities with a need to define who is member, and who not. This is important to determine who is eligible to vote, who has to pay taxes, and who has access to public services such as education, health care, social security, and other social services. This is usually defined through citizenship, although there is a large grey zone between ‘unwanted foreigners’ and full citizenship. Immigration policies of modern states typically include ‘pathways’ to permanent residency and citizenship, in which permanent residents typically enjoy largely similar rights to citizens, except for the right to vote (at least in national elections). It would therefore be foolish to argue that countries should just 'open their borders' by allowing everybody to immigrate and settle. Modern (welfare) states have an inbuilt need to define who is member and, hence, who has the right to work and who can use public amenities and social services. This creates an intrinsic need for immigration policies, which define who has the right to enter, stay, settle and eventually acquire citizenship. There is nothing inherently immoral about this. It is thus a legitimate right of sovereign states to control their borders. To achieve this, modern states have designed sophisticated immigration rules that use elaborate criteria such as nationality, age, diplomas, marital status and wealth to grant or refuse people the right to enter and settle. Contrary to what many people think, states have generally been rather effective in regulating migration. Although media images of migrants scaling fences or crossing the sea in rickety boats may give the impression that borders are ‘beyond control’, the fact is that the vast majority of migrants abide by the rules. With some exceptions, irregular migrants form a small minority of all immigrants, and research has shown that most undocumented migrants have in fact crossed borders in a legal fashion, but 'overstayed' after their visas expire. The ‘open borders’ proposition is clearly naïve, as modern states need to establish rules about entry, stay and citizenship. However, the ‘closed border’ proposition is equally naïve. Total migration control would basically require a totalitarian state in order to effectively control all maritime and land borders. Total migration control would require the literal ring-fencing of entire countries, a total disrespect of human rights (such as the right to family life and asylum), and a willingness and practical ability to invest massive resources to round up and deport undocumented migrants. It would also require giving massive powers and resources to police forces for internal surveillance, such as massive random ID checks and the frequent raiding of places where immigrants live work - including people's private houses where many domestic workers stay. In practice, such levels of total migration control are not possible in open, democratic societies, and any politician suggesting this is therefore selling illusions. The reality of migration policy making is thus infinitely more nuanced than the false opposition between closed and open borders. In practice, immigration policies are about selecting, and not about ‘closing’ or ‘opening’ borders, neither of which exist in practice. This was confirmed by a recent analysis of 6505 migration policy changes in 45 countries I conducted with my colleagues Katharina Natter and Simona Vezzoli (for more information, see this free-for-download article which we recently published in International Migration Review). Although politicians may have an interest in making people believe that they are 'tough' on migration, our analysis shows that over the past decades governments of most Western countries have liberalized immigration regimes by relaxing or giving up immigration restrictions for many migrant groups. 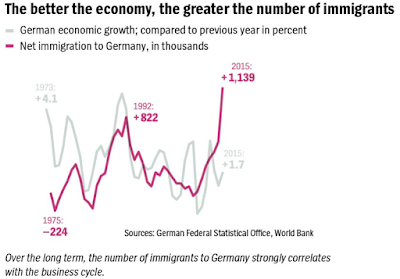 Immigration has generally become easier for high- and even low-skilled workers, students and wealthy people. Also within regional blocks such as the EU, migration policies have been liberalized. The main exceptions on this rule are family members of low-skilled workers and, particularly, refugees from developing countries. Refugees in particular have become the target of restrictions and fierce anti-immigrant rhetoric, although in reality refugees form a small minority of all immigrants. The essence of modern migration policies is thus not about growing restriction or influencing numbers per se, but the selection of migrants; By favoring the entry of some groups, and discouraging the entry of others. This shows that both 'open' and 'closed' borders are simplistic rhetoric positions, which ignore the complex reality of migration policy making. While the desire of political communities to regulate migration is legitimate, it is important to consider the effectiveness of policies, which are often blatantly ignored. As with any form of regulation, immigration rules can be circumvented by migrants. 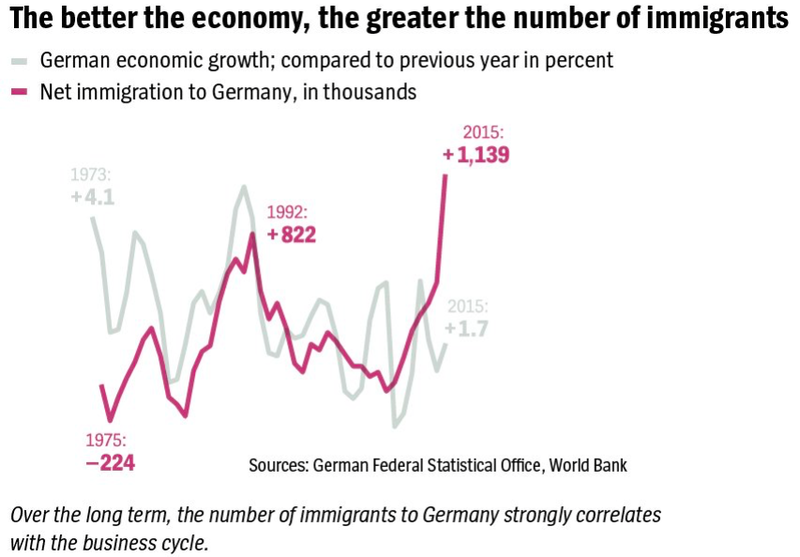 This particularly happens when immigration rules are at odds with the structural causes of migration. Classic examples are structural labour demand for migrant workers in destination countries without legal channels to match this demand (resulting in irregular migration and stay) or the unwillingness of countries to host refugees (resulting in an increased role of smuggling and boat migration and the risks refugees have to take to reach safe lands). It is therefore inevitable that border controls will result in some degree of irregular migration. Also, research has shown that immigration restrictions often interrupt circulation by discouraging return and pushing migrants into permanent settlement, which is the contrary of what these policies intend to do. Such unintended and often unforeseen effects of immigration controls does not mean that the desire to control is illegitimate, or that the policies are totally ineffective, but reveal fundamental policy dilemmas in terms of how and the extent to which the desire to control regulate migration can be translated into concrete results, and against which financial and humanitarian price. This shows that both the 'open' and 'closed' border positions are unrealistic and do not justice to the complex realities of migration policy making, which is primarily about the selection of migrants, and not about numbers, despite muscle-flexing political rhetoric suggesting the contrary. States have good reasons to control immigration and it would be an huge exaggeration to say that borders are beyond control, because policies generally work and the majority of migrants abide by the rules. It is more correct to say that there are clear limits to border controls. The recent news coverage about migration, and particularly the 'refugee crisis', often gives the impression that border crossings by asylum seekers and refugees are an important or even the main source of migration in the current world. This perception adds to the widespread idea that the world is facing a swelling tide of people leaving war-torn countries that is threatening to run out of hand, and that therefore requires urgent action. This crisis narrative is reinforced by international organisations like the UNHCR (United Nations High Commissioner for Refugees), IOM (International Organization for Migration), and the United Nation's population division, who regularly release press statements - repeated in the news media all over the world - reporting that the number of refugees and migrants has reached an all-time high. This usually goes hand in hand with calls for urgent action to address this pressing issue. As so often with migration, the reality is more nuanced. In fact, the total number of refugees as a share of all migrants in the world is rather limited, and has remained remarkably stable if we look at long term trends. According to official figures compiled by the UNHCR there are currently about 16.1 million refugees under their mandate. This figure would rise to 21.1 million if we include Palestinian refugees, who do not fall under UNHCR's mandate. This is less than 0.3 percent of the total world population (7.4 billion people), and about 10 per cent of the total estimated number of international migrants, which currently hovers around 220-230 million (excluding refugees). While the international migrant population counted as a percentage of the world population has remained remarkably stable on levels of around 3 percent of the world population since 1960, refugee numbers have shown more fluctuations, mainly depending on the level of conflict in origin areas. 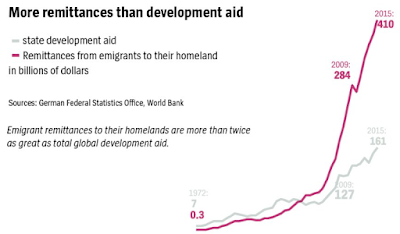 Between 1990 and 2010 the number of refugees showed a declining overall trend. This decrease mainly reflected a decreasing level of violent conflicts in Africa and Latin America. In 2010 the total number of refugees in the world was estimated at 16 million. In recent years these numbers increased again to 21 million, mainly as a result of the Syrian civil war. But on world scale this is a relatively limited increase. This recent increase is not unprecedented, because also other conflicts such as in former Yugoslavia have led to major temporary spikes in refugee numbers. Only a minority of the world refugee population end up in wealthy countries. According to UNHCR about 86 per cent of all refugees stays in developing countries, and this share has increased rather than decreased over recent decades. Poor countries such as Kenya, Afghanistan and host huge refugee populations. The large majority of Syrian refugees stay in Turkey, Lebanon and Jordan. Does that mean that there is no problem? Of course not. The unwillingness of the world community to host sufficient numbers of refugees and their indifference of many governments to plight of refugees, has been one of the most pressing issues of humanitarian concern over the past decades. But the problem is fundamentally not one of numbers, but of international cooperation, solidarity and willingness to really address this problem. Particularly since the end of the Cold War, Western countries have shown a decreasing willingness to welcome refugee populations, and have systematically tried to prevent their legal entry. It is therefore a misleading - and ultimately self-defeating - strategy to keep on repeating, every year again, that total numbers of refugees (or migrants) have reached another all-time high. This ignores that relative to the total migrant and world population, the the total number of refugees is relatively small, and that, on the longer term, refugee numbers have remained relatively stable. 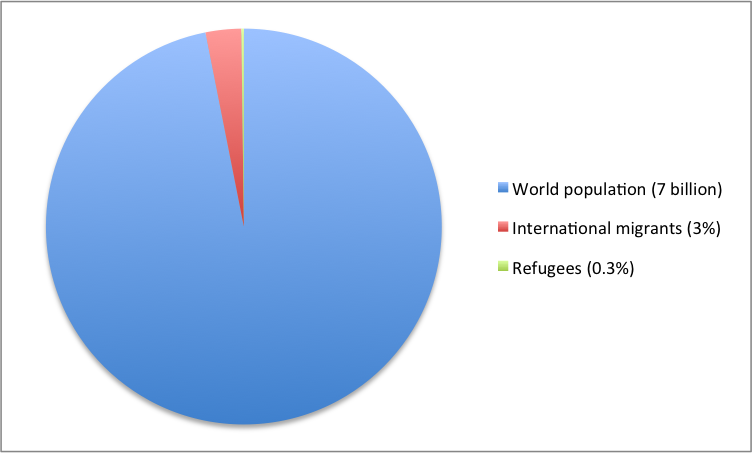 There is 1 refugee for every 352 people worldwide. It would therefore be outrageous to suggest that, in numerical terms, the international community would not have the resources to provide refugees with a safe new home and perspective on the future - if only it can get its act together. It is therefore a matter of willpower; Not of numbers. Understandably, international organizations have an interest in raising public awareness about the plight of refugees. However, their emphasis on 'highest ever' numbers is counterproductive and may ultimately undermine the case for refugee protection, which is the exact opposite of the mandate of these organisations. By hugely exaggerating the true scale and increase of refugee migration these organisations reinforce the crisis narrative and extremism that undermines public support for refugee support and that reinforces extremism. In this way, their 'refugee migration is at an all-time high' public statements may well contribute to the same migration panic and xenophobia these organisations simultaneously tend to decry. A general sense of panic is dominating media coverage of what has come to know as Europe's 'refugee crisis'. It conveys the image of a massive exodus going on from the Middle East and Africa to Europe, with European countries struggling to control borders in order to prevent an invasion from happening. To be sure, we are dealing with a grave humanitarian tragedy, that needs urgent addressing. Yet the idea that we are facing a biblical, uncontrollable exodus is sheer nonsense. This idea needs urgent correcting, because the panic and political fear-mongernig around the issue works paralysing on efforts to find a practical solution to deal with the issue. As I have argued earlier, this crisis is largely self-inflicted. It is not a crisis of migrants or refugees, but a result of entirely counterproductive border controls and Europe's shameful failure to get its act together in sharing sharing responsibility for refugee reception and status determination. As we can now witness on TV screens on a daily basis, the millions of taxpayers' Euros spent on border controls over the past years have been a total waste of money, which mainly resulted in a rising death toll and the geographical diversion of migration routes. For instance, the recent increase in asylum and refugee migration through the Balkan is partly a reaction to increased border patrolling in the Mediterranean, which was in itself a response to increased asylum and refugee migration to Italy and Malta. 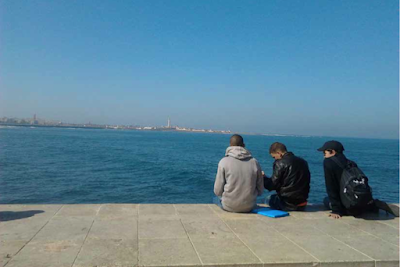 Ever since the Schengen visa regime was introduced in southern Europe in 1991, which interrupted relatively free trans-Mediterranean movement, migrants and border patrollers have been involved in a constat cat-and-mouse game leading to a constant shifting and geographical diversification of maritime and overland crossing points. Instead of stopping border crossings, it created new markets for smugglers who help migrants to cross borders without getting caught. To correct a widespread misunderstanding, smuggling is a reaction to border controls, not the cause of migration. Ironically, policies to 'combat' (to refer to a common but inappropriate belligerent term used in this context) smuggling only increased the dependence of migrants and refugees on smugglers, thus making matters worse. The current crisis in the Balkan region clearly shows that intensifying border controls at one crossing point (such as between Libya and Italy, or through building a fence along the Hungarian-Serbian border) only leads to a geographical reorientation of crossing points. It is therefore outrageous that politicians still get away with making us believe that border controls can 'solve' refugee crises. The irony is that such policies increase the reliance of refugees and migrants on smugglers as well as the likelihood that people go underground. So, such 'tough' policies make migration less controllable and manageable, while they pretend to do the opposite. This is why migration hardliners deceive the public. Unless the European Union turns into a closed police state by literally erecting a new Iron Curtain circumventing the entire Mediterranean coastline and Eastern land borders, ignoring all refugee and human rights conventions, and systematically deporting all people arriving at the borders - which is very unlikely - it is an illusion that refugees can be stopped from arriving. Does that mean that 'borders are beyond' control or that we should abolish immigration rules? Not at all. There are good reasons for states to regulate mobility by determining who has the right to stay and who not, including the right to asylum. Most European other states have developed quite sophisticated and often rather effective rules and institutions which regulate the entry of workers, family members, students, and asylum seekers. Based on the UN Refugee Convention, most European states have set up clear rules and procedures to determine who has the right to asylum and who not, including provisions for the latter to return. The systems are in place, they just need to be implemented based on a European sharing of responsibilities, which might imply adjusting the so-called Dublin Regulations. The current crisis is therefore not one of real numbers but one of an impotence or, rather, and outright refusal of European governments to get their act together in finding a collective reaction to the increase in the numbers of Syrian and other refugees making their way to Europe. In many ways, European national politicians such as Hungary's PM Orban fall on their own sword of fear-mongering around the current refugee situation. While fence building only worsens the problems they pretend to solve, the accompanying rhetorics about massive (Islamic) invasions paralyse any sensible response and debate. Such fear-mongering may serve to rally electoral support and to deflect attention away from more important domestic political issues, but is totally irresponsible in terms of providing effective ways to deal with the current situation. It is worth mentioning here that the numbers of asylum seekers coming to Europe in 2015 are large, but by no means uncontrollable. Refugee hardliners commonly argue that we should seek 'regional solutions' for refugee problems. This may sound sensible but also this argument is deceptive as it totally ignores the fact that the large majority of refugees worldwide already find refuge in their own region. 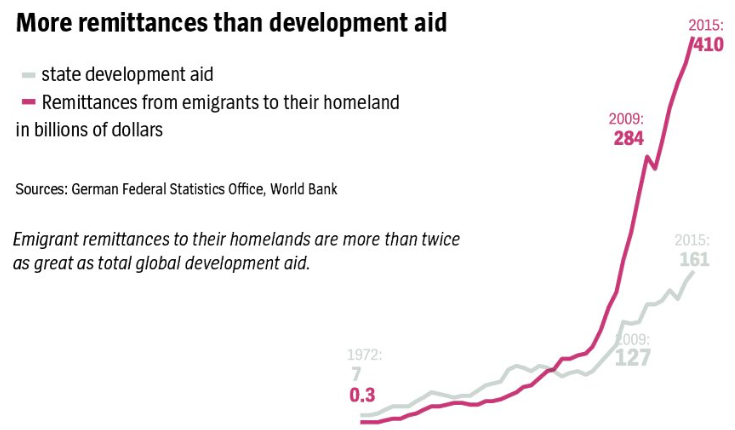 Developing countries host over 86% of the world’s refugees, compared to 70% ten years ago. This is not only because many refugees lack the resources to travel far, but also because many refugees simply prefer to stay close to home. This also applies to Syria. 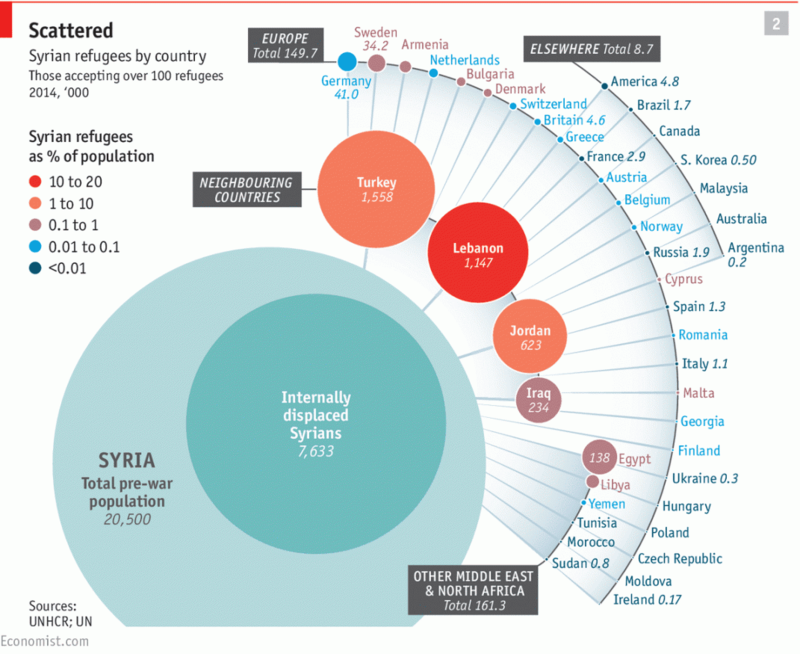 As the above map shows, the overwhelming majority of Syrian refugees have stayed either in Syria, or in neighbouring countries, particularly Syria, Lebanon and Turkey. Of the about 3 million people who have fled the devastating violence in Syria, only about 5 percent (about 150,000) are currently registered in Europe. What makes the 'regional solutions' argument not only deceptive but also really hypocritical is the extremely lukewarm support of many governments for providing support to refugees residing in the region. There is an acute shortage of international funds to help refugees in the region, which is hampering humanitarian assistance efforts to meet the needs of Syrian refugees as well as in communities hosting hem in neighbouring countries. Against the about USD 4.5 billion needed for such programmes, only one third has been received. This funding shortfall has led to a reducation in food assistance, school attendance and health services. The deteriorating situation in neighbouring countries is one of the direct causes of the rapidly increasing numbers of Syrians moving to Europe. With regards to numbers, the more than 300,000 Syrians and other nationals who have so far crossed into Europe irregularly over 2015, is certainly a big increase compared to earlier years. This increase has been clearly driven by conflict in Syria and origin countries and the increasingly dismal situation for refugees in neighbouring countries. However, to suggest that Europe cannot deal with such numbers is nonsensical. For instance, Lebanon (with 5.8 million inhabitants) alone hosts more than 1.1 million Syrian refugees, or 19% of its population. In this light, the idea that the European Union, which counts over half a billion inhabitants, and is the wealthiest economic block in the world, would lack the resources to host several hundreds of thousands of asylum seekers is simply outrageous. In this context, it is worth reminding that 300,000 asylum seekers is equal to less then 0.06% of the entire EU population, and that legal immigration to the EU alone is about 2.5 million on a yearly basis. As long as conflict in Syria and other countries persists, it is likely that a relatively small, but sizeable number of refugees will find their way to Europe. To think it away, or to create illusions that 'regional solutions' will solve this problem, will only make matter worse. Of course Europe can deal with this. Any representation of the current refugee flows as 'massive' is therefore misleading. The current crisis is not one of numbers, but a political crisis, a crisis of the failure of Europe to find a joint response to this issue. In their short-sighted attempts to please their constituencies, national politicians create illusions that intensifying border controls on national level can solve this problem, while it only diverts migration routes to other countries, expands the market for smugglers and increases the death toll. In this way, 'hardliner' countries such as Hungary and the United Kingdom shift the burden of refugee reception to more welcoming countries such as Germany and Sweden, who bear a disproportional burden. The only sensible respons to the current situation is a collective one, in which European countries share their responsibility for refugee reception and asylum processing by developing some quota system, largely along the lines proposed by the Angela Merkel and the European Commission. The real crisis is therefore political one, not one of hordes of refugees invading Europe, which is a product of conscious political fear-mongering and uncritical, sensationalist journalism. As long as politicians get away with making us believe that 'closing borders' will solve this problem, the problems will only get worse. The real crisis is a crisis the unwillingness of European countries to get their act together and formulate a collective response by agreeing on effective responsibility sharing. Both morally and practically, this is only way to address this crisis. A second element of a more effective response is to dramatically increase support to help refugees in neighbouring countries, so that they are not forced to move on if they prefer to stay close to home. Unfortunately, so far no agreement has been reached because such proposals have been sabotaged by national politicians eager to show off their 'toughness' on migration and failing to take their responsibility. Sensible responsibility sharing on the European level and genuine support for Syrian refugees in neighbouring countries are the only way forward. There are no quick and simple fixes to this problem, but the least European politicians can do is to stop deceiving the public by going tough on migration, which only fans the flames of xenophobia and does not provide any practical way to stop people suffering and dying at Europe's borders. The reporter continues by reassuring the reader that enforcement is fortunately increasingly effective: "even if aliens manage to break through the defences it is not long before they are caught and deported". 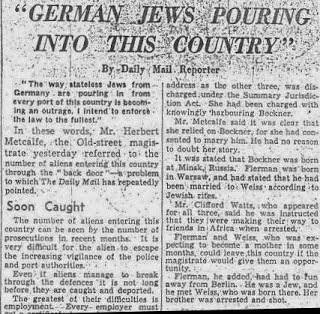 This article did not reflect some extremist, far right-wing sentiment, but a widespread anti-Semitic sentiment in Europe and the concomitant fear of massive immigration of Jewish refugees from Germany, who had been stripped of their German citizenship by the Nazi regime. In the late 1930s, when the situation of Jews in Nazi Germany became increasingly dangerous, European nations and the United States only accepted limited numbers of Jewish refugees. The Nazis initially saw emigration as an important 'solution' to what they called the 'Jewish Problem', including emigration to Palestine. However, European and American countries became increasingly reluctant to host significant numbers of Jewish refugees, while the British closed Palestine to Jewish immigration in 1939. When MS St. Louis, a German ocean liner tried to find a refuge for 915 German Jews, they were denied entry to Cuba, the United States and Canada, before returning to Europe, where many were killed during the Holocaust. Also neighbouring countries like the Netherland and Switzerland closed their borders out of fear of being inundated with Jewish refugees, and many were sent back to Germany. (Although, thanks to smugglers, thousands were able to get out despite tough border controls). Such immigration restrictions were often defended with the argument that the crisis-stricken European countries could not bear the burden of large-scale Jewish immigration, but widespread anti-Semitic sentiment was generally the real reason. For instance, in 1938 the Dutch prime minister Colijn argued that allowing in more refugees would cause economic pressures. Wryly, he explained that the border closure was actually in the interest of Dutch Jews themselves, because allowing in more refugees would further fan the flames of anti-Semitism. In an official statement the Dutch government proclaimed that "a further intrusion of alien elements will be harmful of the maintenance of the Dutch race. The government finds that, in principe, our limited territory should be reserved for its own people". Of course 'expats' are just emigrants. They only don't like to be called that way. These days, in Western Europe, the term 'migrant' is more and more associated to supposedly low-skilled people from less wealthy countries, who often have a darker skin, and/or are of a Muslim background, and who come to work and settle in the countries of the Wealthy, White West, sometimes without asking permission. Europeans living abroad love to call themselves 'expats', although they are of course migrants. 'Expat' has increasingly become a class marker, a way in which privileged migrants from wealthy countries (and wealthy migrants from poor countries) tend to distinguish themselves from poor, low-skilled and undeserving migrants. Migrants do the dirty, dangerous and demeaning ('3D') and underpaid jobs shunned by many Europeans, but are at the same time often treated as potential job thieves and benefit scroungers or as threats to safety (terrorists! ), social cohesion and cultural unity. All of that of course does not apply to Europeans when they themselves move abroad to work and settle in foreign lands. In sheer contrast to the moral outrage about the 'illegal migrant', 'expats' often do not even bother applying for a residence permit in their host countries. Either because they don't need one, or because nobody bothers them if they don't have one. Between 1998 and 2000 I lived in Morocco for two years on a string of tourist visas, which I renewed by hopping out and in of Morocco forth and back from the Spanish enclave Ceuta on the same day. It is very unlikely Europeans who overstay their visa in Morocco - and most countries in the world - will end up in migrant detention and get deported. And if they are asked to leave, they are highly unlikely to do so handcuffed. This is called privilege. And many Europeans (as wel as North Americans and citizens of a handful of other lucky nations) are hardly aware of it. They take for granted that it is their right to go anywhere, to impose their presence, while not being bothered about how 'locals' perceive them. They have done so since colonial times. It starts at a young age. Students find it completely normal to have gap years, to travel around the world, or to work or volunteer for a year or so in a far away country. We go on holiday wherever we want, and more and more people retire in lands where the sun shines and care workers are cheap. Wherever Europeans find a job, residence and work permits seem to drop magically out of the air, or we simply don't bother getting one, or it is done for us by our employers. Those working for private companies, diplomacy or as development workers in poor countries tend to live luxurious, but highly segregated, lives as 'expats' in gated communities and compounds. When they interact with 'locals', it tends to be the elites, who speak the same languages and have similar manner and levels of education. Looking at migration, we still live in a colonial world order. Double standards are typically applied to the migrant 'other' and the expat 'us'. While migrants are expected to learn the language and to assimilate into 'our' culture and society - and 'we' complain if they refuse to do so, or not fast enough, or not wholeheartedly enough to our taste - 'expats' are generally exempt from such demands. English speaking citizens of wealthy OECD countries set the international standard. Haughtily, 'expats' often do not bother to integrate at all, and nobody would dare to ask them to do so. They can live for years, if not decades, in other countries without speaking one word of the local language. Because they have the power to do so so and to ignore what others think. Such double standards also become visible in the schizophrenic positioning of politicians on migration issues. During the 2014 municipal elections in the Netherlands, the right-wing liberal VVD party of PM Mark Rutte was campaigning with election posters featuring the text "In Rotterdam spreken we Nederlands" ("In Rotterdam, we speak Dutch") to clearly signal the VVD's anti-multicultural credentials. However, the same rules did apparently not apply to 'expat' migrants - overtly shown by another VVD election poster targeting resident foreigners who have the right to vote in local elections, which proudly stated (in English!) "Why do expats living in Amsterdam vote VVD?". The contrast in attitudes towards expats and migrants was also visible in the graphic (see above) used by the anti-immigration United Kingdom Independence Party (UKIP) in a campaign to encourage 'expat' Britons (an estimated 5.5m in total – of which about 2.2m live in the EU- almost the same number as the 2.3m EU citizens in the UK) to vote in the 2014 national elections. 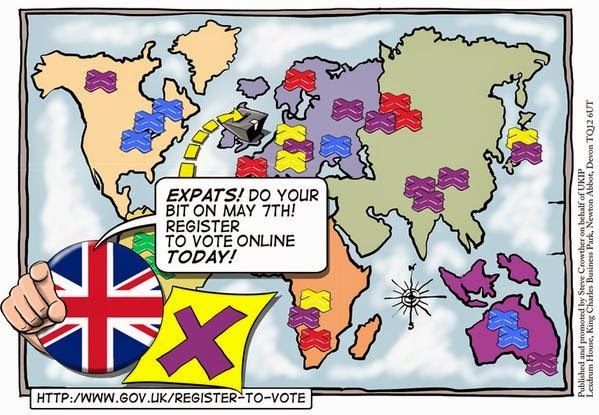 So, ironically, by "harnessing that xenophobe expat vote" the UKIP tried encouraging British emigrants to vote them in to keep immigrants out of Britain. Such contrasts in attitudes reveals the double standards applied to the expat 'us' and the migrant 'them'; as well as the superiority thinking underlying this distinction.